Beautiful, nutritious beet greens, all sprouted from one little beet seed (which is actually a dried fruit containing a cluster of 2 to 6 seeds). You'll find more about growing beets in my previous post, How To Grow Beets from Seed and Why You Should. And Caramelized Beets with Garlic is my favorite beet recipe. I currently have 13 unopened packets of heirloom beet seeds in my posession—the newest from 2009. I may need a repeat of that 2007 massive seed packet purge. Organized gardeners probably sort through their old seeds before placing their new seed orders. I finally placed my first seed order for 2012 last Thursday, and then decided to dig out all of my various (actually somewhat organized!) containers of seeds. Thankfully I hadn't ordered any beet seeds. I hope they're still good. I'm tempted to just mix all the seeds together like I sometimes do with lettuce seeds so that I won't end up with any big empty rows, but it might be better to know which variety is which. With eight of my 4'x8' raised beds all prepped and ready for spring planting (only 17 more to go! ), I've been itching to get a jump on direct seeding something before we launch into lambing season next week before we get any further into lambing season and I completely forget about the garden. (I wrote most of this post yesterday morning and by last night lambing season had begun!) If all goes well, we should have about 40 baby lambs bouncing around the farm by the first of April, and they pretty much consume my life—in a cute overload kind of way. But despite a freaky heat wave this past week, the calendar says it's still a little early to direct seed beets. You can start beet seeds indoors (five weeks before the last frost), but I'll just wait and direct seed when it's closer to the recommended planting time, three to four weeks before the last frost, which is officially April 15th for us, though we often have later frosts and/or earlier hot weather. Spring in Missouri is usually pretty strange, weather wise. Whether you start your beet seeds outdoors or in, you'll want to soak them in water for 24 hours first to aid germination. 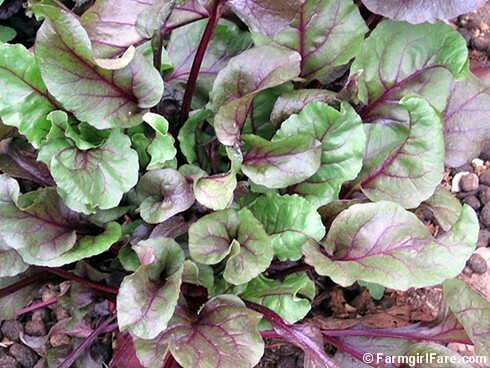 Avoid planting beets where you've just grown spinach or Swiss chard. Beets prefer deep, well-drained soil that includes plenty of organic material such as compost or aged manure. 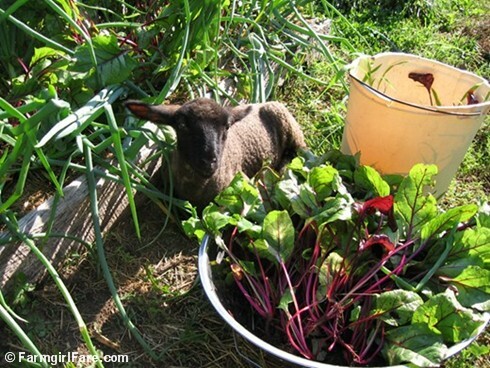 Keep your beets cool by growing them beneath mulches; grass clippings work great. Good companions for beets: bush beans, the cabbage family, corn, leeks, lettuce, lima beans, onions, and radishes. Bad companions: mustard and pole beans. For more beet planting tips, check out my previous post, How To Grow Beets from Seed and Why You Should (which I've updated with some of the information in this post.) And don't forget that the beet greens are edible, too! Seedlings need to be thinned (more thinning info in the post mentioned above), and the tender young leaves are wonderful in salads. Although in general beets grow best in cool weather, an extended cold snap (two or more weeks below 50°F/10°C) that occurs after beet plants have formed a tidy rosette of leaves can force them to bolt, which ruins the quality of the roots. If a long cool period is expected, place a floating row cover over plants to keep daytime temperatures above 50°F (10°C). What I really need to be doing right now is starting tomato, pepper, and basil seeds indoors in flats. These cold intolerant plants need to grow under lights in the warmth of the house until night air temperatures stay above 45°—and after lambing season. Fortunately I already have plenty of tomato, pepper, and basil seeds to get me started. (I list my favorite heirloom tomato varieties here and talk about how many tomato plants you need here.) But of course there are also more on the way. If you're minding the moonsigns, fertile days in the first and second quarter are the best time to plant most seeds. Remaining in this first quarter: Monday, Tuesday, and Wednesday (February 27th-29th). Then March 26th and 27th. Second quarter: Saturday March 3rd and March 31st are it. The first quarter is best for starting lettuce, broccoli, greens, beans, etc., plus onions. The second quarter is best for peppers, tomatoes, eggplant, squash. I avoid planting anything on Sundays because I once read it was something like a black hole of death, only good for doing things like weeding, and have been understandably paranoid ever since. The same goes for the entire fourth quarter, though many people treat it just like the third quarter. Maybe I shouldn't have told you this. Because beets form underground, they should be planted on fertile days in the third quarter (another 'sign' I shouldn't be planting any beets yet! ), along with garlic and potatoes and other root plants such as carrots, turnips, and parsnips (but not onions), plus bulbs and perennials. Seedlings of all kinds should also be transplanted in the third quarter. Best beet planting days are under the signs of Cancer (breast), Scorpio (groin), Pisces (feet), Libra (loins), and Capricorn (knee): March 10th, 12th, 13th, April 7th, 9th, and 12th. So it looks like mid March for me and my beet seeds. I plant by the moon as best I can because I need all the gardening help I can get. I explain a little more about minding the moonsigns in this post, which is a review of this great reference book: Astrological Gardening The Ancient Wisdom of Successful Planting & Harvesting by the Stars by Louise Riotte (of Carrots Love Tomatoes: Secrets of Companion Planting for Successful Gardening fame). Are you a beet grower? Any tips, tricks, favorite varieties, or recipes to share? © FarmgirlFare.com, where it's time to head back down to the barn. The seeds may still all be in their packets, but the three adorable new lambs make it easy to forget. Last year I grew Crapaudine, Chioggia, golden, and bulls blood. My Crapaudine didn't do very well, but the others were great. Bulls blood were delicious, Chioggia and golden were good too! I will plant all 4 again this year. Maybe I'll have better luck. It seems to me that since your seed is old anyway, and you didn't buy it this year, what could it hurt to plant some of the beets and see what happens? It has been an unusually mild winter and you might get lucky. But if not, there is nothing lost, because the seed was old anyway. I have a confession...I've never tasted beet greens. But I plan to fix that this year because I'm growing some. Yours look beautiful! I have tried beets for 3 or 4 years in a row and I have NEVER had one get as much as 1/2 inch in size, if that. I have no idea what I've been doing wrong, and everyone tells me how easy they are to grow. Great to see all your beets. I'm not sure if they would grow in our tropical climate with lots of rain? Like you, gardeners here plant by the phases of the moon. The older ones simply use the following: things that grow up should be planted 3 days before Full Moon and things that grow down, 3 days after full moon. Some also use MacDonald's Almanac, which does of course give the full range of astrological gardening dates. Happy planting! We just ate some pickled beets that have been hanging out in the refrigerator since, oh, June or so. I use a recipe I got from my mother-in-law's sister's husband (got that?) for HIS Aunt Belvie's pickled beets. They're just as southern as they sound, and really delicious. They were the treat I offered my son to lure him out of grandma's lap so she could eat her dinner in peace. Gotta love a kid who thinks pickled beets are a treat. The closest I've gotten to planting by the moon is putting my fava beans in for a fall/winter cover crop during the first full moon of October. Beyond that, I'm a moon planting failure. I have yet to try growing Beets, the hubs will not eat them but I think thats because they take on that "Earthy" flavor only after they are cooked, they are beautiful chaved into think slices and in salads and that is just what I will have to do this year, grow beets and make him a changed man - ha! I didn't used to like beets until we started growing them ourselves last year and HAD to eat them and their greens, and now I actually love them! The soil quality is not great in the fairly new community garden where we do most of our veggie gardening, so our beets were small, too. But this spring, I'm going to use almost all of our compost to beef up the small garden in our small yard and try the beets there instead. A recipe I tried last summer and liked a lot was Little French Beets from the New Basics Cookbook. You can find it online. Beets, onions, bacon, balsamic vinegar... Can't go wrong! And now, I must check out your "How to Grow Beets from Seed" post to learn everything I don't know! I cant begin to give you enough praise for your fabulous blog! I have never been much of a "disciplined" gardener, but since my husband and I bought some mountain acreage- all I have dreamed about is creating some sort of homestead. I'm determined to be a whole lot more self sufficient, and reading your musings always give me plenty of ideas, and make me optimistic that even in this day and age, a family farm can exist, no matter what the size!